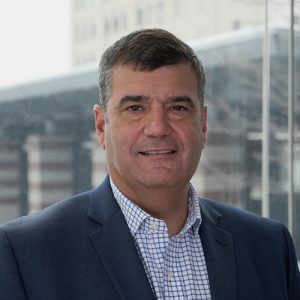 Jim Saber is President & CEO at NextEnergy, a Detroit non-profit, accelerates cleantech solutions that create smarter, healthier, more accessible communities and cities. Mr. Saber previously lead the business and technology development and demonstration activities to support commercialization and business growth of NextEnergy’s advanced energy clients and stakeholders. Mr. Saber’s experience includes the development of over $150 million in technology development and demonstration programs within e-Mobility, Smart Grid, Buildings and Infrastructure, MicroGrids, Energy Storage, Renewable Energy, and Alternative Fuels. He has lead NextEnergy’s work in establishing new technology development and demonstration platforms within next generation energy efficiency and transportation applications. Mr. Saber currently serves on the board of the Institute for Energy Innovation and TechTown. He contributes to the Department of Energy’s Industry Peer and Annual Merit Review efforts within Vehicle Technologies and Hydrogen programs. He also serves on multiple Society of Automotive Engineers standards committees for hydrogen and fuel cells. Prior to joining NextEnergy, Mr. Saber spent more than a decade in the energy-storage industry, where he held product- and business-development positions with Fortune 500 and start-up companies. This includes ten years with Duracell leading development efforts for primary and rechargeable batteries for telecommunications, computing, and consumer electronics applications, and four years with Millennium Cell, a chemical hydride storage technology where he lead technology development and licensing efforts within automotive and military applications. Mr. Saber holds a B. S. degree in Electrical Engineering from Lawrence Technological University.